My hubby got me a pot of yellow calla lilies last night, they are beautiful, can someone tell me if they will survive if I leave them on my bookcase. I have the flourescent lamp still on my Scarlett O'Hara Morning Glories which are growing like crazy, or do I need to find a way to put them in direct sunlight? I have my mums on a telelvision tray in front of the window with a curtain between it and the window because as I showed you it would not fit on the sill. This calla lily is the same way, the pot would fit on the sill, but the flowers would not. I have never had a calla lily before and I would like to know how to take care of it properly. Calla lily (UNLIKE the mum! ) should do okay indoors for the winter. Put it in the window that gets the most hours of sun. Only water it when the top couple inches of the soil are dry, as they are sensitive to over watering. In the spring and summer, you will fertilize it, but not now; it is too close to the end of the season. During end of fall and the early part of winter, slowly allow the soil to dry up in order to allow it to have a dormant rest period. Trim the foliage to the soil level after it turns yellow and dries up. 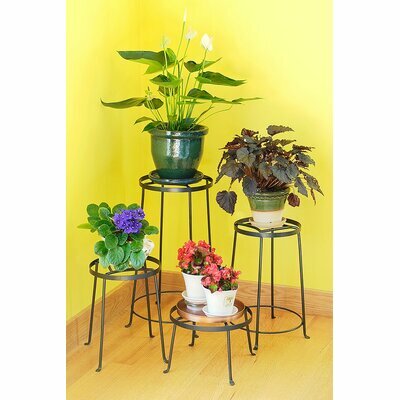 For pots that are too big to sit on window sills you need pot stands that will lift it up to window level so it gets better light. I got mine cheap from I think Big Lots. The come in different heights and widths. Or of course you can build a wide shelf right under the window sill, or if you have a low bookcase or something you can put under the window and set the plants on .... but some how you have to get those plants up in to the light. They will get very little light sitting on the floor. But I still think the mum has to go out for the winter.